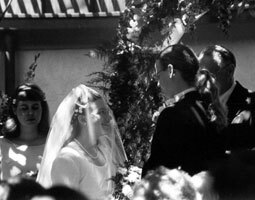 In July of 2001, Cristyn and I were married. If it was not the happiest day of my life, that is only because there have been so many happy days with her. I have learned so much about love from knowing her that the whole world is different, in a way. 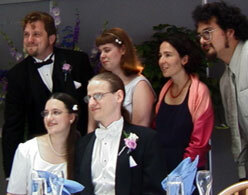 I've put up some pictures of the wedding here. You can also read our vows, sort of a transcript of the ceremony itself. Many of our friends and family were in attendance. The shot here on the right is of the head table. Cristyn and I are in front. From left to right the others are Ryan, the Best Man; Jen, the Maid of Honour; Giovanna, a friend who came all the way from Italy for our wedding; and Jerry, who shall lack an appositive description. Music for the ceremony and reception was provided by the hot jazz combo of Dia Silverstein, Pat Shaw, and Nick Carvajal. We'd originally just asked Dia to play flute for the processional and recessional, but she decided to bring in Pat. When we met with the two of them to pick out songs, they asked if they could add a drummer. They played through most of the reception, riffing on jazz standards. Fabulous stuff. Special thanks to Giovanna and Douglas for sharing these photographs.